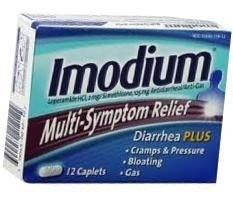 Controls symptoms of diarrhea plus bloating, pressure, and cramps commonly referred to as gas. Take only on an empty stomach (1 hour before or 2 hours after a meal). If possible, use weight to dose; otherwise use age. 2 Caplets after the first loose stool. 1 Caplet after each subsequent loose stool. But no more than 4 caplets in 24 hours. 1 Caplet after the first loose stool. 1/2 Caplet after each subsequent loose stool. But no more than 3 caplets in 24 hours. Store between 20-25 degrees C (68-77 degrees F). Do not use if you have ever had a rash or other allergic reaction to loperamide HCl. Do not use if carton is open or if printed foil seal under bottle cap is open or torn.